I have spent the last several months wearing a Smith & Bradley Sans-13 Tactical Watch. In that time, it has been through the wringer and it performed well. The Sans-13 ticks all the checkboxes that I like in a watch. I can’t afford fancy watches and the activities that I take part in generally don’t lend themselves to fancy watches any way. I tend to favor tough watches or what some people call “tool watches” – the kind of watch that you aren’t afraid to wear. I have found that, if a watch is going to break, it will break most commonly in one of three places: the crown, where the strap meets the case, or the movement. Knowing this, I generally shop for watches that address these potential failure points and that is what drew me to the Sans-13. The Sans-13 systematically addresses each of the above failure points. Their case design incorporates a large integral fence design that nearly completely shields the crown from impact. Even when the crown is unscrewed for adjustment, the fence is large enough to protect it. 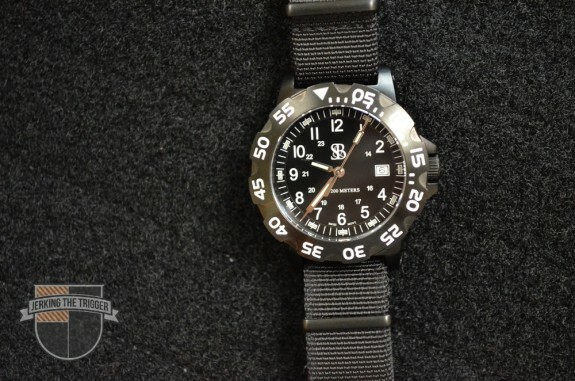 This is a must have on a daily use watch in my experience and that is doubly true for a watch billed as “tactical”. I have yet to meet the spring bar (the little spring loaded bars that retain a watch strap between the lugs) that I couldn’t break so I was glad to see that Smith & Bradley did away with them for the Sans-13. They have been replaced with solid pins that actually screw into the lugs. You need a tiny jewelers screw driver to remove and replace them but you need special tools to work with spring bars too and you should rarely have to deal with them. 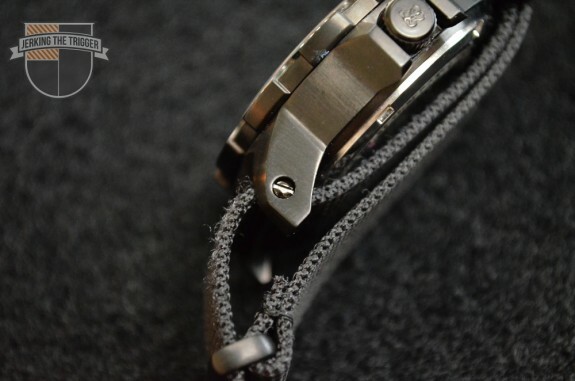 With some types of straps, like NATO style webbing straps, you will never have to remove them. 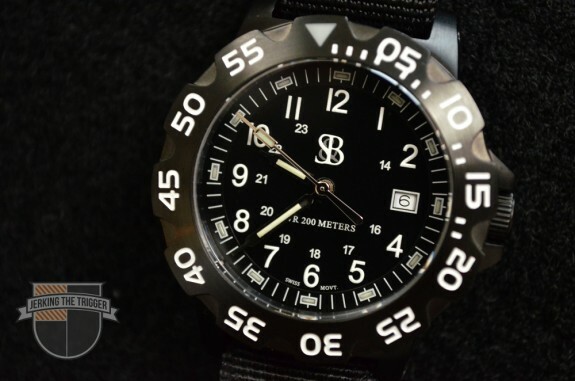 Finally, Smith & Bradley builds these watches with a Ronda 6003.D, 4 Jewel Swiss Quartz movement. The 6003.D movement isn’t going to turn heads like some movements but it is proven, robust, and accurate. It is a very good choice for a watch like this and a quality Swiss movement like this puts it ahead of much of the competition in terms of quality. In the time that I wore this watch, I split and stacked nearly 6 cords of wood among other things. I use a maul and splitting axe to split so you can bet that this watch took some significant impact and vibration. It came through better than my elbows which are still sore. This is a durable watch. 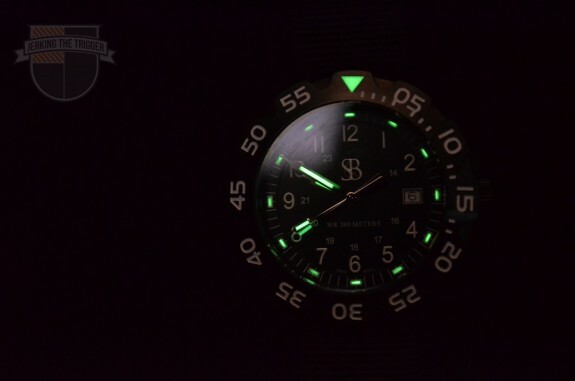 Smith & Bradley nailed the lume on this watch. Their lume is a little bit unique in that it appears to be contained in small vials rather than painted on. I have a simple test for paint style lume. If I can give it a quick hit of light from a flashlight before bed and then still be able read it in the dark after a full night of sleep with dark adjusted eyes, I am happy. That is really all you can expect from lume. The Sans-13 easily passes that test. If you need a brighter solution, you’ll need to go to tritium. Watches with tritium markers are generally brighter than I prefer for the first few years. Not because I am concerned baddies will see me as dynamically enter the refrigerator at night but because I just don’t care for the obnoxious glow in a dark room. Give me a watch with functional, high quality lume any day. The Sans-13 has markers on all three hands, at each hour on the face, and a single large marker on the timing bezel. I like my watches large but not obnoxiously so. The 43mm case on the Sans-13 is just right. 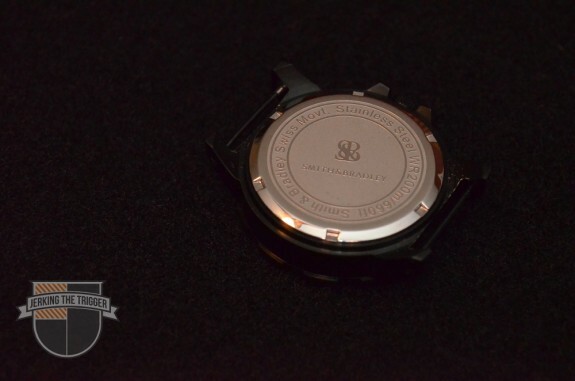 It means that the face is large enough to read and timing bezel is large enough to use. Speaking of the timing bezel, it is well designed and executed. The clicks are positive and the bezel is easy enough to turn even with gloves. That is a strong positive for me since I actually use the timing bezel all the time. I have also been impressed with how new the Sans-13 still looks after several months of wear. The 316L stainless steel case is black PVD coated. PVD holds up extremely well to normal use. It also benefits from an anti-reflective coated sapphire crystal which is extremely hard and difficult to scratch. Previously, the Sans-13 shipped with a silicone strap which I generally don’t care for. I was happy to see that they currently ship with a NATO style strap (or at least mine did) that appears to be of very good quality. Some NATO straps are straight up junk but this one has held up very well. There are a few things that I wish were a bit better. First, it would be nice if the second hand lined up a bit better with the markings. As it is now, it is close but the second hand sort of splits the markings on the face. While this isn’t an overly expensive watch, it isn’t cheap either. I suspect that this example is not typical of most Sans-13s. In fact, a friend purchased one and his lines up perfectly. The second item is preference. I wish the face was a bit less busy. The S&B logo is relatively understated but it could probably be smaller. I like the 24 hour markings but when you add it all up, it just looks a bit busy. Don’t get me wrong, it is still readable and it is still a very attractive watch. I just think it could be a bit less cluttered. I don’t normally address price unless it is integral to the draw of the product. In this case, I can already hear some of you complaining about the price of this watch and that is okay. You probably aren’t the market for it anyway. Not everyone needs or appreciates a watch like this. 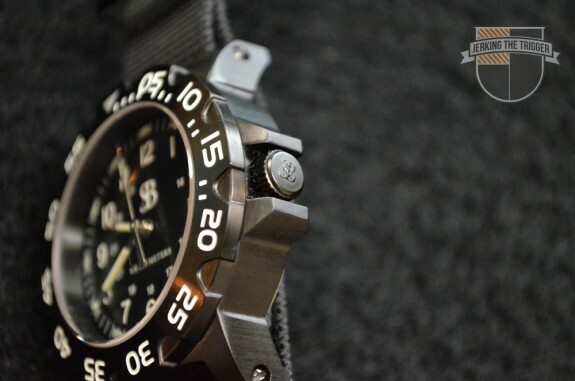 In terms of movement, quality of the case and crystal, quality of the lume, and durability features, it actually compares very well to other competing “tactical” watches. In fact, I have owned watches from a well known maker that is probably the largest competition for a watch like this and I won’t own another. They broke far easier than their reputation would indicate. 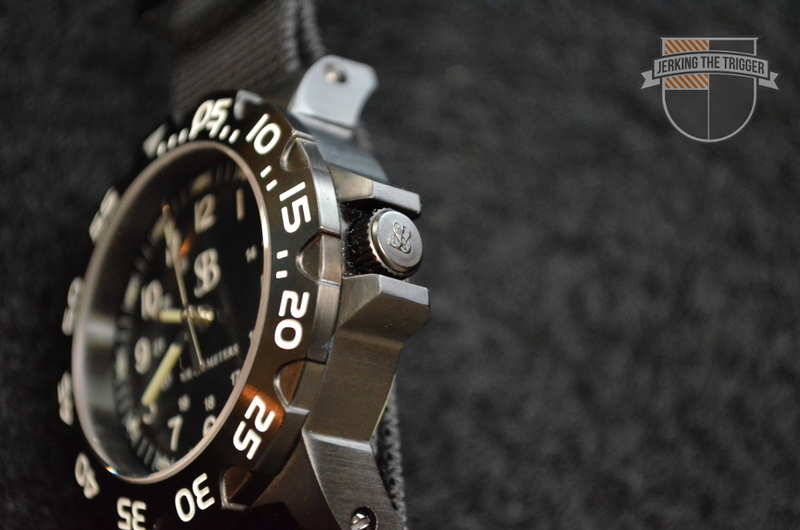 The Sans-13 actually offers you some strong value in the form of a solid Swiss movement and a good quality case. I can’t speak to the tactical merit of the Sans-13 since that would be out of my lane. I can say that it has shrugged off recoil at the shooting range and impact while splitting wood. It is handsome enough to wear to church and it seems like it will stay that way for a long time. The design has specifically mitigated the 3 most common ways I have seen watches break. It may not be inexpensive but it is a solid watch with some very nice attention to detail in the design.